I'm free I'm free! Four whole days of no work people. So ready for the break! Today was filled with some fun stuff but my favorite of the day is when one girl came over with a file and was like "did you send this letter?". I was looking at the letter and I was like I think maybe but I'm not sure (I do a lot of letters). This one wasn't signed and was obviously the original and not the copy that we would usually put in the file. I went and looked in my emails and my boss had asked the girl that sits next to me to "prepare the letter and put a copy in the file". So she wrote the letter and just put it in the file! Like um maybe it needed to be signed and mailed out??? LMAO. She was like well she didn't say to mail it. aye aye aye are you kidding me? Luckily there were only 2 of the letters and still time to address what they were for. A bit later the other girl was like SPIDER and gets up and backs away from her desk. I went over and tried to shoo it out with my folder so I could step on it but it went into the crack of her cube. She spent the rest of the day freaking out that it would come out and trying to force it out with canned air. Freaking hilarious. 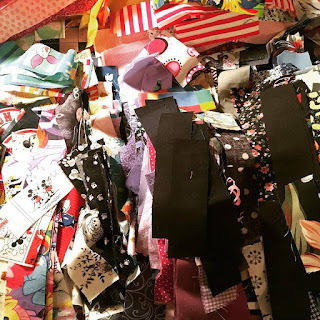 So last night I didn't get to any actual sewing I just ended up cutting the rest of my pile of scraps and sorting them. Now I have the measurements for the bowtie I need to make so I'm going to do that as soon as I get off here. Hope it turns out ok! Just going to make soup and sandwiches for dinner later since I'm not very hungry and don't want to cook (and just spent 1/2 an hour washing dishes already). 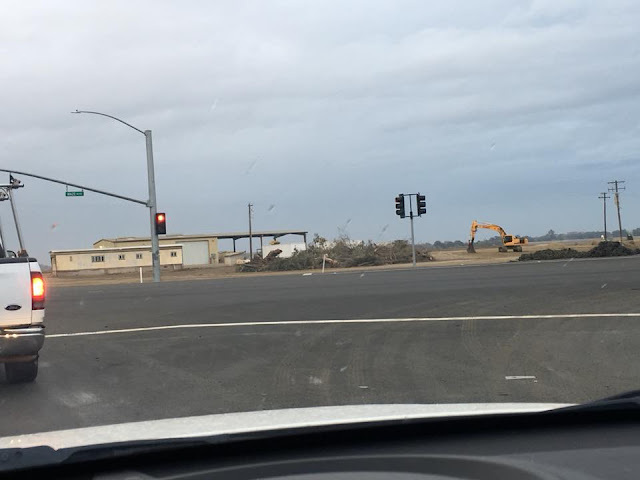 They've been cleaning this area up that I drive by 2 times a day. Before you couldn't even see the buildings over there because of the giant trees and junk around it. I'm guessing they are going to plant almond orchards all around it. They have been working the soil behind the shop (there is lots of land back there) and on the other side of the street too. Today I noticed they knocked over an older orchards a little bit down the road. I think they are probably going to plant it all at once. We shall see! Great job getting all your fabric prepped! Now to the sewing!!! HA! I hope you enjoyed those four days!!!!!!! !